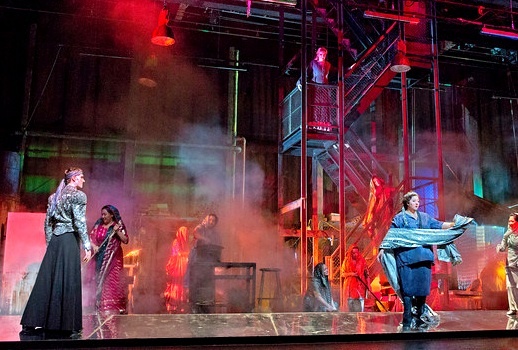 The simple fable at the heart of Die Frau ohne Schatten shouldn’t be difficult to parse, but Hugo von Hofmannsthal’s libretto juggles its vaguely Jungian, vaguely Arabian Nights symbolitry as if with intent to mystify and bewilder. He never could explain, for instance, even to Richard Strauss, why the fish dinner in the frying pan sing with the voices of the Dyer’s unborn children, except that it was a nifty effect, which it is. Strauss made of this myth so rich a dessert, so triumphant a climax to the post-Wagnerian school, that many a puzzled opera-goer is content to let the meaning go hang, and wallow in the leitmotivational soufflé. But FrOSch (as we devotees call it) is a legendary music-drama with psycho-sexual undertones. Your spirit will rise even higher than the endlessly ecstatic concluding quartet if you take its universal message to heart. This message is similar to that of Parsifal but perhaps more straightforward, as suits a work created during the distant thunders of the Great War: We are only truly human if we can feel empathy, compassion, for other human beings, even highly dissimilar ones—as the Spirit-born Empress learns to feel it for the lowly human couple, Barak the Dyer and his Wife. Without compassion, we are creatures of solitary ego who might as well have hearts of crystal or any other mineral. Experience and emotion will pass through us leaving no stain or touch of emotional involvement. The shadow is a symbol of our shared, earthy humanity, with all its dirty imperfections—and only those with shadows are worthy of producing more humans. Folks who saw the 1966 O’Hearn-Merrill production of FrOSch tell everyone who didn’t see it that it was the most magical thing the Met ever presented, matchless, gorgeous, fairy tale, ideal-and yes, it was. But it’s gone. If you didn’t see it, you can’t miss it now. If you did … well, adjust your expectations. Herbert Wernicke’s 2001 production, now revived and revised, is a fine, gaudy bit of stagework. The walls of mirror for the magical realm, enhanced by projections, doubles, torches and the Met’s underappreciated stage elevator (absolutely silent as the four- or five-story set slithers back and forth, in and out, up and down!) make a dandy backdrop for multidimensional show, and the mirrors conceal inopportune shadows until the story is ready to receive them. The seamless flow of stage-high trickery in Act III should tickle any theatrical fancy. J. Knighten Smit is credited with redirecting the piece in place of the late Mr. Wernicke, and he has corrected a couple of the production’s bêtises: The humanoid falcon is now entirely red, without white feet and hands showing (which always made me queasy), and he (Scott Weber) does mid-air somersaults, perhaps to excess, rather than sulking about the stage in a moody lump. The horse is out, and with it the Emperor’s double who rode it across the stage during an interlude. The four principals do not turn into robots at the end of Act II and mount the girderwork staircase in lockstep trance. I could still happily do without the refrigerator that casts a cold light on bitter Barak at the end of Act I.
nd to crown our pleasure in a home girl making good, she’s been signed as the Met’s next Brünnhilde. Her frumpy Dyer’s Wife is never glamorous but often touching, shrewish but from resentments that also make her singing withdrawn—saving herself for the full-throated outpouring of love in Act III. Anne Schwanewilms (the Empress) and Torsten Kerl (the Emperor), the former a debutante, are Straussians of experience and talent, but the voices of both seem a size too small for the Met, especially when they sing from the rear or middle of the stage. The Empress’s opening monologue and resolve to find a shadow and her nightmare scena in Act II were often inaudible over the orchestral rumble. One trembled to anticipate Schwanewilms’ big scenes in Act III, but both Strauss and the set were ready for the occasion: The Empress’s music fades to chamber music tones, a cello, a few violins, a harp glissando or nothing at all during her long, climactic scene, and Schwanewilms sang much of it on the stage apron, where she was loud and clear, emotional and affecting if not as heart-rending, brink of hysteria, as a Leonie Rysanek. She is a slim, handsome woman, commandingly tall even beside Goerke. A staging note: In Act II, the Empress should not be in the thick of the action, helping out with kitchen chores … she should be (as Barak notes) hiding in the shadows, observing, making the judgments that will resolve the story and not letting her “disability” become visible. Kerl’s Emperor, though a dignified stage presence, made no clear impression of person or anguish in Acts I or II—the scene where he considers which weapon to use to kill his apparently treacherous wife should touch our hearts. His voice, which seems to have the proper range for Strauss (he was last heard here as Menalas in Aegyptische Helena), was pleasant when he, too, sang from the stage apron. The Nurse (Amme) was sung by Hungarian mezzo Ildikó Komlósi, who has given us an intriguing Herodias in seasons past. She is a handsome woman and an effective, enthusiastic actress, full of the right sly and hypocritical gestures, but her sizable mezzo was not in perfect control. Notes slipped out of tune or could not be held to a firm line. The Nurse is as strange a character as even von Hofmannsthal and Strauss ever concocted, and her music is extreme as her jagged, ironical, desperate personality, but this performance did not fill the bill on lyrical grounds. If she was portraying her character’s cross-purposes, it was not a very musical portrayal. Johan Reuter sang Barak with a warm, firm sound and an excellent command of Straussian line, matched by his acting. Richard Paul Fink’s Messenger of Keikobad was imposing and sturdy. Jennifer Check filled the house as the vocal aspect of the wounded Falcon. Andrey Nemzer, a countertenor, sang the Guardian of the Threshold. His costume was identical to Mr. Fink’s; it was a charming shock to hear an alto voice emerge from it. Microphones carried the voices of the unborn children and the illusory boyfriend, in ways that did not sound mystical but, frankly, electronic, and the ladies in waiting conjured by the Nurse from thin air lacked languor. Vladimir Jurowski conducted the score, uncut—as was never true with O’Hearn-Merrill; Christian Thielemann was the first to open Karl Böhm’s excisions. Most of the restored passages have to do with the Nurse’s malice and the Dyer couple’s longing, and it is good to have them back with Goerke and Reuter to sing them. Jurowski has led this opera in many houses and knows how to display its high points and when to let the brass and drums go wild (during the interludes). Some pensive passages seemed a bit rushed where one was used to more time to let the feelings hidden in its embracing themes reveal themselves. (The opera takes four and a quarter hours, with intermissions.) Jurowski’s skill showed itself best when the imperial couple were pushing themselves to be audible; he held back and allowed them to shine through. I’m sure they were grateful to have him. The whole cast seemed in fine fettle for their standing ovation.